Went out this morning to try to catch a Blackbuck that had been hitting a protein feeder several times during daylight hours. Started out cold in North Texas with 34 degrees. For all situated with camera set up and now ready by 6:30. Turkeys were talking to the moonlight. About 7 all the turkeys (about 30 or so)flew down and started fighting and running around. About 20 minutes later the Blackbuck came through but didn't present a shot. About 30 minutes later he did the same thing again. At 8:30, I noticed him feeding just around the corner of the blind. Got the camera turned and release clipped on. He walked straight into the protein feeder and gave me a 19 yard slightly quartering away shot. I did not hesitate and smoked him! He made some good vertical jumps and made it about 100 yards. Got to see him wobble and go down in sight! Nick blackbuck! They sure eat good and make beautiful mounts! Good looking animal right there. Congrats! Nice job. Congrats on a beautiful animal. Cool blind. What is it made from? Congrats! He's a nice one! 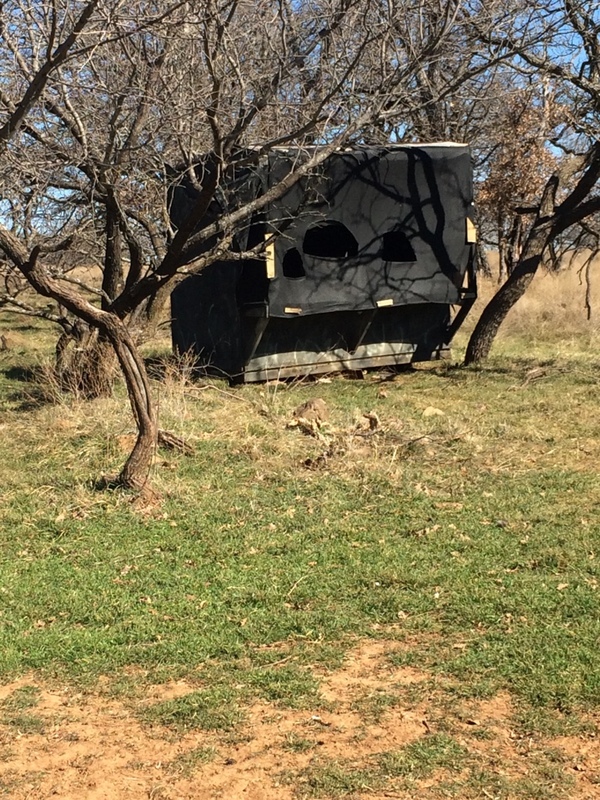 The blind is wood with a couple layers of black mesh on the front. (Not mine). Very nice! 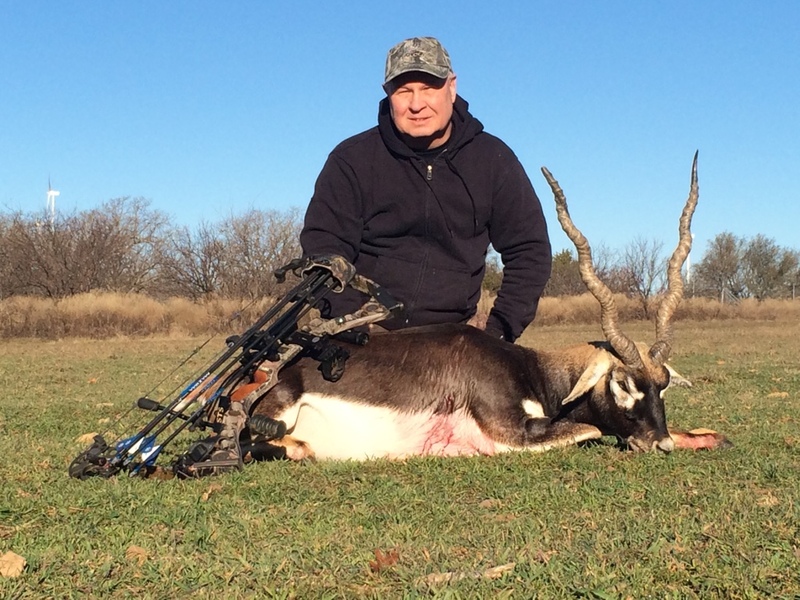 Congrats on awesome blackbuck!! 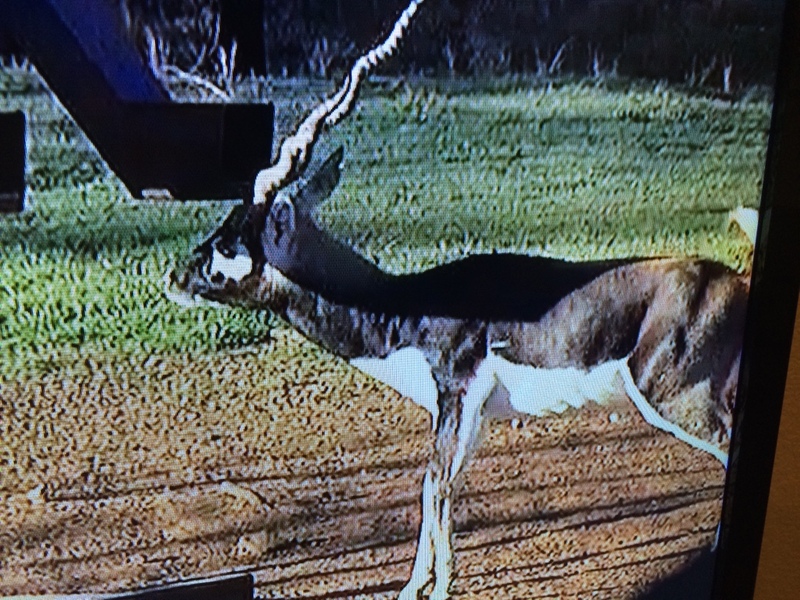 That's a great blackbuck congrats! He was 19 1/4 straight line. He was an old herd buck that was getting past his prime. Not as big as the one in my avatar, but a good one! Love to hunt these things! Way to go !! Beautiful animal for sure. Nice Black buck and good shooting! Congratulations on the BB. He's a good one. Congrats on a great looking BB. Congratulations on the blackbuck. They make beautiful mounts. Great blackbuck, harvest wouldn't have happend to be in Jack county would it? Could see the wind turbines in the background and we've been seeing a few near out lease to the last few years. Very nice. I want to get one sometime they are beautiful. Nice one! A blackbuck is on my need to kill list! Just looked on my wall. Yours is bigger. Nice work! Nice BB. I want to get me one someday. Congrats! A blackbuck is definitely on my bucket list! I've got to get me one of those...very nice. Pretty looking animal for sure. Can't wait to get one of my own. Congrats. Congrats! Is there a video of the shot? The one in your avatar looks 60"
Nice, congrats. One of those are on my list.